Coca-Cola enthusiasts like to display their love for the product and product design. Logo bedding options are sure to please most Coca-Cola fans who want to decorate their bedroom with the famous brand. 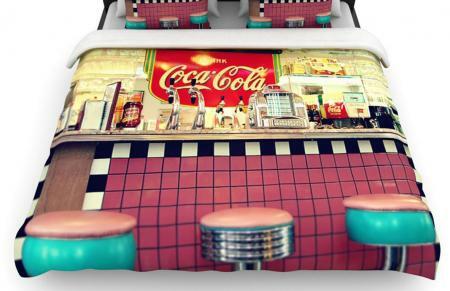 This unique artistic duvet cover presented by Kess InHouse features a classic diner in a colorful design. The duvet is a cotton/polyester blend that's lightweight and features a zipper closure. Made in the U.S.
Pros: The design is very artistic - almost photographic quality - and can become a centerpiece for a retro themed bedroom design. Cons: This is the duvet cover only and customers will need to provide their own insert. Price: Expect to pay about $110 for a twin, $120 for queen, and $150 for kin/Cal king, plus shipping, from Amazon. 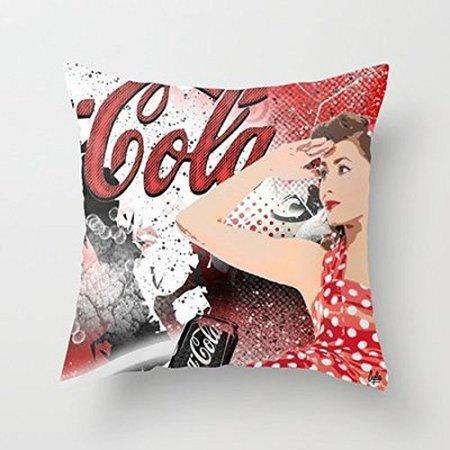 This decorative Coca Cola pillow cover features two-sided printing. The pattern depicts a woman dressed in a 1940s style bathing suit given a patriotic salute to the logo "Cola". Colors are mainly red, white, and black. Pros: This cover makes a great throw pillow for a Coca-Cola themed bedroom design; you could also use it as part of a vintage-themed den or family room. Cons: The nostalgic retro pattern may not fit a more modern themed room design or masculine decor. Price: You'll pay about $20 at Walmart. 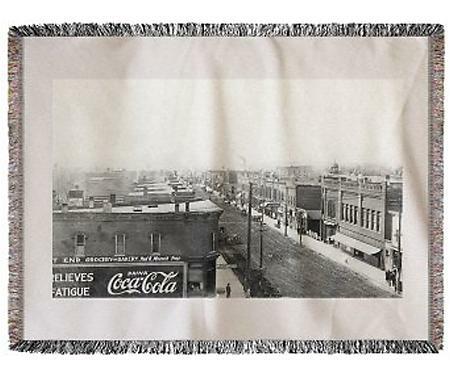 An iconic retro picture of a Coke billboard is backdropped by Belle Plaine, Iowa, in this aerial photo woven into this chenille blanket. Decorated with fringe, this blanket/throw is handmade is woven using a jacquard loom. The Chenille yarns make this blanket very soft and adds a touch of luxury when draped across any Coca Cola themed bed. Made in the USA. Pros: This bedding displays a work of art in both construction and the photo print used on the blanket. You can use it as a throw on a bed or couch, or even hang it on the wall. Cons: The black and white graphic might detract from a traditional red and white Coke color scheme, especially if the retro look isn't the right theme. Price: It will cost about $100 with free shipping through Walmart. 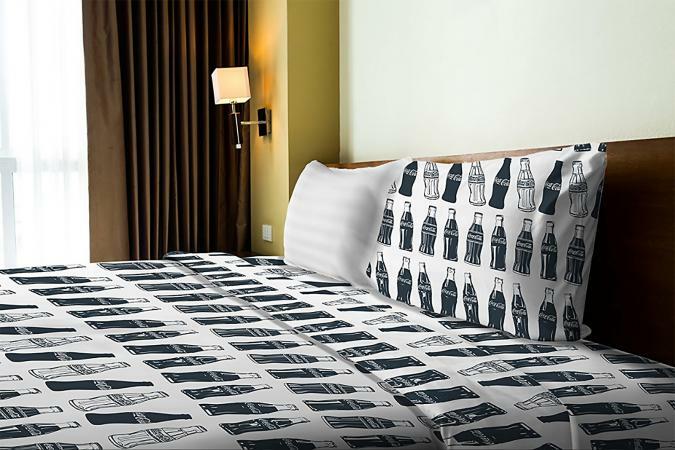 This Coca-Cola bottle sheet set comes with three pieces and can be found on Houzz and Amazon. The black and white classic Coke bottle is an ideal choice for a any collector and enthusiast. The sheets are 100% polyester and provide a soft comfortable bedding choice. Machine washable. Size: The twin size set includes, one flat sheet, one fitted sheet and one standard size pillowcase. Pros: The traditional glass Coca-cola bottle is on full display in this row by row design. The black and white color scheme is a wonderful complement to the Coke red and white as well as other colorful bedding choice. Cons: Some customers may find the bottle pattern too large and busy. Price: Both websites sell the set for about $30 plus free shipping. Go bold! Go rustic! This 100% polyester blanket features an old barn siding background in the Coca-Cola red and white colors. The barn wood texture bleeds through the logo for a very effective design. The blanket is available with two back finishes. One is a plush fleece and the other is a Sherpa fleece. Machine washable and tumble dry makes it a great bedding choice. Sizes: 50" x 60" or 60" x 80"
Pros: The blanket is a soft and cozy choice. It would work well in a rustic bedroom, den, or even garage. Cons: This rustic look may not suit all bedroom designs. Price: You should expect to pay about $50 or $60, respectively. Coca-Cola fans are sure to appreciate logo bedding choices. 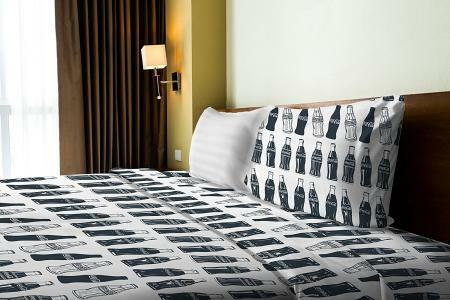 Be sure to check ebay and Etsy for more unique and often custom-made Coca Cola bedding.